This is a favorite at my house. I happen to know it's a favorite at Jaime's as well. I think the first time I had Sour Cream Lemon Pie was probably one Jaime brought for Thanksgiving- she makes one every year. It's so delicious though... sweet, tangy, creamy, just yum; that it would be a shame only to have it once a year. So I've had to start making them myself. The recipe is pretty simple- just takes some time at the stove (which can be a bit tricky with kids, I know). But soooo worth it. (oh, just a side note. This recipe is for a 9" pie dish, but I only have a 10" deep dish, so I did a recipe and a half and it fit perfectly). Cook on medium heat til thick and bubbly. Reduce the heat and cook and stir 2 more minutes. I think it's easiest to have all my ingredients ready to go at this point, because things start happening fast and you don't want to be scrambling while your filling is burning. -just a hint. Beat the egg yolks slightly and add 1 cup of the hot mixture into yolks. Return yolk mixture to saucepan and bring it back to a gentile boil. Cook and stir 2 more minutes. Pour in the filling! Yeah! Let it cool in the fridge and its ready to eat. Hurry and take a picture before it's gone! In a saucepan, combine sugar, flour, and salt. Gradually stir in milk. Cook and stir on medium heat until thickened and bubbly. Reduce heat, and cook and stir 2 more minutes. Remove from heat. Beat yolks slightly. Gradually stir 1 cup of mix into yolks. Return yolk mixture to saucepan, and bring to gentle boil. Cook and stir 2 more minutes. Remove from heat, and stir in butter, peel, and juice. Fold in sour cream. Pour filling into baked pie shell, and cool. Top with whipped cream if desired. This looks delish! Can't go wrong with sour cream or lemons. This sounds delicious! We love lemon at my house. Sounds like a cool, refreshing Summer dessert! This looks so refreshing. I've got to make it! I'm so glad to see that you linked up this week. Thank you so much for sharing this at Recipe Sharing Monday. I hope to see you back next week! This pie looks beautiful. I love a cool, creamy lemon pie. I'd like to invite you to share your recipe on A Well-Seasoned Life's Sweet Indulgences Sunday. What a fantastic pie. 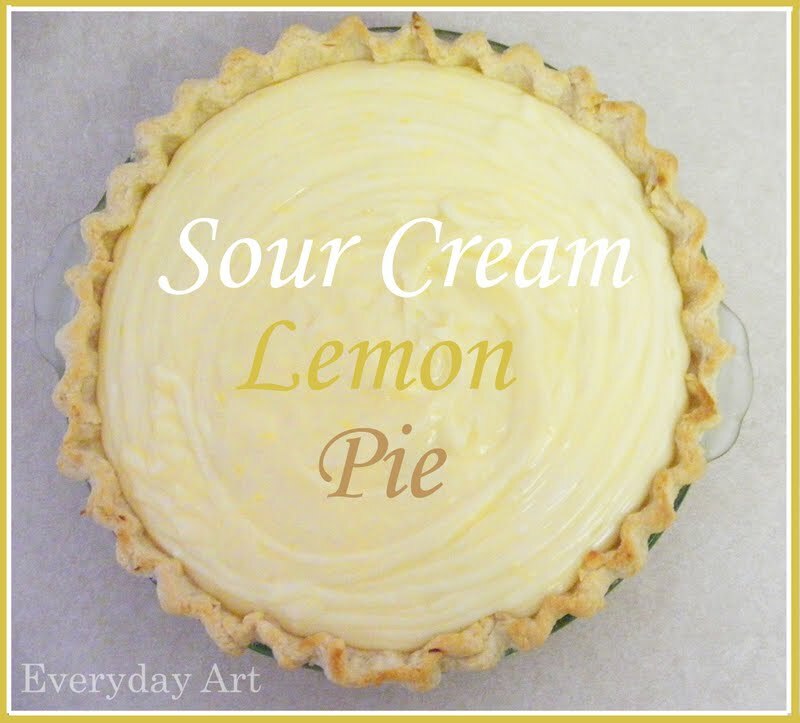 I just love a lemon pie and this is a great summertime treat! Thank you so much for sharing with Full Plate Thursday and hope to see again real soon! Hope you are having a great week end! Oh wow, this looks divine. Creamy lemony goodness!! This sounds so delicious! Perfect for a summer pie. Thanks for sharing! Yum - I love all things lemon flavored! I'll have to pin this and give it a try! Looks scrumptious! Saw the recipe over at Jam Hands! These would be cute as little mini pies with some homemade whip cream on top... Visiting from SugarFootMomma.com and newest follower! Thnaks for linking to WorkShop Wednesday. I fetuared your pie for my sweets week! Took 2 pies to a Relief Society activity at church...didn't bring any home! Everyone loved it! Thanks for sharing! I love all of the lemon recipes! Thank you so much for joining Fat Camp Friday! See you next week! MUST MAKE this pie!! I love anything lemony and creamy and this looks beautiful. Following you through the Monday blog hope now. This looks SO good! My husband loves anything with lemon so I'm definitely going to give this one a try! Oh, delicious! Lemon-y goodness. Thanks for sharing! Found you from the Foodie Friday blog hop and following. This looks beautiful!! My mouth is watering.... I can't wait to try it for my family. Following you from the Foodie Friday blog hop. Your crust looks so good. Impressive. Popped over from the VB hop, late but here. Love your blog. A-M-A-Z-I-N-G. Thanks for linking up! I'm reading the recipe and my mouth is watering. Will be making this real soon. Sounds luscious! This post has always had the link to the recipe, but now I've gone ahead and put the recipe right in the post for you! My grandma made a pie she called Quick Dinner Pie. This sounds a lot like hers. I am so glad I found this. My family absolutely LOVED this recipe! I did 1.5 times the amounts shown (with 5 eggs) for a deep dish pie. I also added more lemon juice and zest, then strained the custard before putting it in the pie crust. SO good! OH MY GOODNESS! I was given a bag of lemons by my neighbor and started looking for lemon recipes on Pinterest. I came across this recipe and thought it would be cute to make it in mini pies with a chocolate heart on the top for Valentine's Day! Not only are they beautiful....the lemon/sour cream pie filling is to die for! I had some left over and just ate it with a spoon. Thanks so much for sharing this delicious treat! Question, do you make your own pie crust or do you use store bought...or is it a secret?! oh, and in the summer if you really don't want to turn the oven on, you could always use a graham cracker crust. No Bake- Yeah! I have made this twice and both times the final product is lumpy. The first time I thought maybe the butter was too cold when I mixed it in and it was forming little lumps, but the second time I made sure I used butter that was slightly melted, and I still had everything go lumpy at the final stage of adding ingredients. I even used an electric mixer on it when I couldn't get the lumps out by hand, and it made no difference. What am I doing wrong? GINGER- I'm sorry to hear that. I have actually never had that problem, BUT where most people run in to trouble with custards is with the eggs. Make sure you are tempering the eggs (add a cup of the hot mixture to the beaten egg, mix well, you can even add more hot mixture again if you want, and then add back to the pot). Also, when you are bringing everything back to a boil after adding the egg mixture make sure you are only using medium heat. Maybe lumps are from the bottom getting too hot at this point. The temperature of the butter shouldn't matter, in fact I think mine is usually pretty hard. Remember to remove the pan from heat before adding them though. 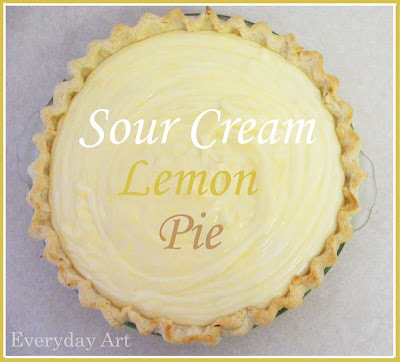 Make sure your butter, zest, and lemon juice are fully incorporated before adding the sour cream at the end. If the lemon juice and sour cream mix they could curdle. That's all I can think of! I hope I helped. Good Luck! oh, and if nothing works and you still get lumps, pour the filling through a strainer. It will take a little while since it's thick, but it will work. EC - What is lemon zest? lemon zest is the very outside yellow part of the lemon peal. Just use a fine grater and grate it right off the outside. Be careful not to grate too deep, the white part of the peal can be bitter. I made this for my dad's birthday this past weekend and THANK YOU! He loved it and it tasted way better than the MC version. I am adding this to my arsenal! I've made this pie three times now, and I still have the same problem with all these little lumps forming after I add the sour cream. I made sure the lemon juice was mixed in well, I've tried letting it cool before adding the sour cream, and nothing stops it. I have found I can pour it all in a blender and run it a few minutes to smooth it out, but nothing prevents it. This really happens to nobody else? Because it happens every time with me. By the way, I won a pie contest this past weekend with this recipe. :) Made a shortbread crust for it - everyone loved it! Sorry this keeps happening!!! I was thinking about it and maybe the sour cream is too stiff. Try stirring the sour cream up REALLY well first, perhaps even with a mixer, and maybe even letting it sit out for a little bit so it isn't so cold when you add it in. I have seen a similar recipe that used greek yogurt but I think the regular yogurt might be too thin and your pie might not set. Congrats on winning the contest though! Gotta love those shortbread crusts. Glad everyone liked it! I just made this for a party, it turned out great, everybody loved it. I cheated a little and used a store bought gram-cracker crust Thanks for the recipe! How much lemon curd do you actually end up with (prior to adding the sour cream)? I have some store bought stuff I was going to use, but want to make sure I don't get the ratio's wrong. Delicious. I made this yesterday for a dinner party. Not sure why, but the filling didn't ever set real well. Do I need to cook it longer? Used limes (15 for $1) instead of lemons and it was FANTASTIC. I was all ready to try this pie when I realized it has raw egg in it.